The Poetry group meet on the 3rd Friday of each month in Eastwood Library between 12.30-1.30 pm. The contacts for the group are Jenny Ball on 01773 602 347 or Freda Hallsworth on 01773 861 502. There are about fifteen members in our friendly group and we decide amongst ourselves the theme for our next meeting. Each member chooses a couple of poems on the theme and we take it in turns to read our choices. These can range from well-known works by famous poets to verses written by amateurs, and even some by one of our members. However, it must be stressed that the aim of the group is to read and enjoy poetry. You don’t have to be a poet to come along and share the pleasure of listening to poems and taking part in the lively discussions that can follow. You can be assured of a warm welcome so why not come and join us? Members are reminded that from May we will be charged £10.00 for the use of the room. It was decided that we would pay £1.00 each when we attend a meeting. Averaged over the 10 meetings a year we should cover this cost. For more information, contact either of the group co-ordinators. Friday June 21st – The works of Dylan Thomas, and as a back up, poems about Summer. Again we were few in numbers with 8 members present as there was a U3A National Trust group visit on the same day. Our topic this month was Walter de la Mare (1873-1956). We read 20 of his poems and discussed how varied his work was, from poems for children to quite melancholy works. Among those we read were “The Listeners” and “Someone” and we speculated on whether “Someone” was written from the perspective of being in the house when the traveller came knocking. The topic to start the new year was Dogs, Cats and other Animals and once again a wide selection of poems were read. Some more serious than others and Pam Ayres was well represented – no less than four of her poems being read by various members of the group. September 2018 -After our summer break, members met to read a selection of first or last lines from their favourite poems. This was a lively and entertaining meeting and, not surprisingly, there were many popular and well-loved verses chosen. We had decided that these would be the theme for the Groups’ Showcase meeting on 3rd October. Jenny produced a beautiful display board with many well-known lines – a lot of which are in common usage. Friday 20th July: We looked at the work of Robert and Elizabeth Barrett Browning. We found that many of their poems were extremely long and some were also sombre. These are the poems we read, with some being extracts from the whole work. The poet Robert Browning is buried in Poets’ Corner in Westminster Abbey. He was born on 7th May 1812 in London, a son of Robert Browning (1782-1866) and Sarah (Wiedemann). He married Elizabeth Barrett, a famous poet in her own right, in September 1846. They lived much of their life in Italy, due to her poor health, and their son was also called Robert (but known as Pen). The Ring and the Book is considered to be his best work and his poem ‘Oh, to be in England, now that April’s there’ is well known. Browning died at his son’s house on the Grand Canal in Venice and was to have been buried alongside his wife in Florence but the cemetery had been closed. The Dean of Westminster, a friend of the poet, offered burial in Westminster Abbey and the family accepted. Robert’s body was returned to London by train. The various certificates needed for the journey through Italy and France are kept in the Abbey archives. The British Vice Consul in Venice certified that his body was enclosed in three sealed cases, one of metal and two of wood. He was buried in Poets’ Corner, near Chaucer’s monument, on 31st December 1889. The Dean had also agreed to the family’s request that Elizabeth be re-interred with her husband but then the family withdrew their application. Alfred, Lord Tennyson was laid to rest beside him in 1892 and the ashes of John Masefield, who died in 1967, lie at his head. The present gravestone was laid down in 1894 and is composed of brown and cream Italian marble with red porphyry and the inscription reads: ROBERT BROWNING MAY 7 1812 DEC 12 1889. In 1906 an inscription was added at the base of the stone: His wife ELIZABETH BARRETT BROWNING is buried in Florence 1806-1861. She was a child of Edward Barrett and was an invalid when Robert began a correspondence with her which led to a secret engagement and later marriage. Her first work to gain public attention was The Seraphim and other poems. After Wordsworth’s death it was thought she might succeed him as Poet Laureate but that did not happen. Her main work is Aurora Leigh. There were only 9 members at our April meeting but we read a wide selection of poems about Spring and flowers. Following the theme of looking at the works of particular poets, the eleven members at this month’s meeting discussed and read poems by Tennyson. Born on August 6, 1809, in Somersby, Lincolnshire, England, Alfred Lord Tennyson is one of the most well-loved Victorian poets. Tennyson, the fourth of twelve children, showed an early talent for writing. At the age of twelve he wrote a 6,000-line epic poem. His father, the Reverend George Tennyson, tutored his sons in classical and modern languages. In the 1820s, however, Tennyson’s father began to suffer frequent mental breakdowns that were exacerbated by alcoholism. One of Tennyson’s brothers had violent quarrels with his father, a second was later confined to an insane asylum, and another became an opium addict. Tennyson escaped home in 1827 to attend Trinity College, Cambridge. In that same year, he and his brother Charles published Poems by Two Brothers. Although the poems in the book were mostly juvenilia, they attracted the attention of the “Apostles,” an undergraduate literary club led by Arthur Hallam. The “Apostles” provided Tennyson, who was tremendously shy, with much needed friendship and confidence as a poet. Hallam and Tennyson became the best of friends; they toured Europe together in 1830 and again in 1832. Hallam’s sudden death in 1833 greatly affected the young poet. The long elegy In Memoriam and many of Tennyson’s other poems are tributes to Hallam. Tennyson became one of Britain’s most popular poets. He was selected Poet Laureate in succession to Wordsworth. In that same year, he married Emily Sellwood. They had two sons, Hallam and Lionel. We decided that in 2018, rather than always reading poems based on a chosen topic, we would also look at the works of specific poets. At our December meeting we had expressed surprise on finding that “There Was a Little Girl” had been written by Longfellow. We therefore decided to look at his other works for our January meeting, together with learning more about Longfellow’s life. Henry Wadsworth Longfellow was born in Portland, Maine—then still part of Massachusetts—on February 27, 1807, the second son in a family of eight children. His mother, Zilpah Wadsworth, was the daughter of a Revolutionary War hero. His father, Stephen Longfellow, was a prominent Portland lawyer and later a member of Congress. Henry was a dreamy boy who loved to read. He heard sailors speaking Spanish, French and German in the Portland streets and liked stories set in foreign places: The Arabian Nights, Robinson Crusoe, and the plays of Shakespeare. After graduating from Bowdoin College, Longfellow studied modern languages in Europe for three years, then returned to Bowdoin to teach them. In 1831 he married Mary Storer Potter of Portland, a former classmate, and soon published his first book, a description of his travels called Outre Mer (“Overseas”). But in November 1835, during a second trip to Europe, Longfellow’s life was shaken when his wife died during a miscarriage. The young teacher spent a grief-stricken year in Germany and Switzerland. Longfellow took a position at Harvard in 1836. Three years later, at the age of thirty-two, he published his first collection of poems, Voices of the Night, followed in 1841 by Ballads and Other Poems. Many of these poems (“A Psalm of Life,” for example) showed people triumphing over adversity, and in a struggling young nation that theme was inspiring. Both books were very popular, but Longfellow’s growing duties as a professor left him little time to write more. In addition, Frances Appleton, a young woman from Boston, had refused his proposal of marriage. Frances finally accepted his proposal the following spring, ushering in the happiest eighteen years of Longfellow’s life. The couple had six children, five of whom lived to adulthood, and the marriage gave him new confidence. In 1847, he published Evangeline, a book-length poem about what would now be called “ethnic cleansing.” The poem takes place as the British drive the French from Nova Scotia, and two lovers are parted, only to find each other years later when the man is about to die. In 1854, Longfellow decided to quit teaching to devote all his time to poetry. He published Hiawatha, a long poem about Native American life, and The Courtship of Miles Standish and Other Poems. Both books were immensely successful, but Longfellow was now preoccupied with national events. With the country moving toward civil war, he wrote “Paul Revere’s Ride,” a call for courage in the coming conflict. A few months after the war began in 1861, Frances Longfellow was sealing an envelope with wax when her dress caught fire. Despite her husband’s desperate attempts to save her, she died the next day. Profoundly saddened, Longfellow published nothing for the next two years. He found comfort in his family and in reading Dante’s Divine Comedy. (Later, he produced its first American translation.) Tales of a Wayside Inn,<> largely written before his wife’s death, was published in 1863. When the Civil War ended in 1865, the poet was fifty-eight. His most important work was finished, but his fame kept growing. In London alone, twenty-four different companies were publishing his work. His poems were popular throughout the English-speaking world, and they were widely translated, making him the most famous American of his day. His admirers included Abraham Lincoln, Charles Dickens, and Charles Baudelaire. From 1866 to 1880, Longfellow published seven more books of poetry, and his seventy-fifth birthday in 1882 was celebrated across the country. But his health was failing, and he died the following month, on March 24 1882. We read the following poems and noted some recurring themes of family, home and fire. Surprisingly nobody read an excerpt from Hiawatha – probably Longfellow’s most well-known work. We may revisit this at a later date. There were 12 members present and the topic for this month was “Falling”. The poems we read reflected many interpretations of “Falling”, some funny and some very sad. There were 13 members at this month’s meeting. Our chosen topic was “Questions and Answers” and these are the poems we read. Our topic this month was “Relations and Relationships”. There were 14 members present and we enjoyed a wide choice of poems, some sad, some about situations we could all recognise and some very funny. These are the poems we read. We had chosen “Spring and other things” as the theme for our May meeting. Quite a few of our members were away on the U3A trip to Whitby, but, even so, we read an interesting selection of poems, which are listed below. My Wife the Gardener Anon. 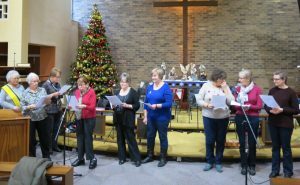 Christmas Social: At the December monthly meeting members of the poetry group read a selection of festive poems, some well-known and others written by themselves. Their rendition of ‘Twas the night before Christmas’ by Clement Clarke Moore was widely appreciated by the audience, who were also entertained by the Ukulele and Creative Writing group. The members and committee gave thanks to the group for their valued contribution.